Pediatric Infectious Disease Medicine engaged by the Diagnostics, treatment and prevention of infectious diseases in children and adolescents. Infectious diseases are the most frequently-occurring disorders in adults and children. Viral and bacterial, acute and chronic, harmless and deadly dangerous - they are all in need of early detection and proper treatment. Childhood infections are widespread, and develops acutely, the body temperature rises, begins intoxication of the whole body: headache, vomiting, nausea, cramps, rash - this is an incomplete list of features that should alert you. Staphylococcus - The cause of staphylococcal infection in children often becomes weakened immunity, poor hygiene, contact with an infected person. If in children were found in the body staphylococci, you should promptly consult your doctor and follow all his instructions. Cytomegalovirus Infection usually occurs in childhood - the infection is spread and easily passed a variety of ways. It is not excluded also intrauterine infection of the fetus, which is very dangerous, as in this case, the virus can disrupt fetal development. Parasites and worms - in children regularly deteriorating health, disturbed the process of digestion and absorption of food, is developed a common intoxication of the organism. It is important to timely initiate measures to restore health. Dysbacteriosis of the intestine adversely affects the state of children's health, as causes a disturbance the processes of digestion and absorption of food, resulting the child's body does not receive all necessary nutrients and vitamins. The manifestations of Streptococcal infection from skin lesions to pneumonia, usually made heavier on the background of immunodeficiency. Improper treatment of streptococcal infection will only aggravate situation, so should start with a competent and thorough examination. Infectious mononucleosis usually affects children and adolescents. Its causative agent - is transmitted by airborne droplets Epstein-Barr virus. The disease is accompanied increase in body temperature, swollen lymph nodes, liver and spleen. Infected with Pseudomonas aeruginosa a child may at contact with an infected person. Presence of this bacteria is dangerous in a significant weakening of immunity. In addition, the diseases caused by Pseudomonas aeruginosa, are difficult to treat. If you find that your child bitten by a tick, shall be imperative immediately remove the insect and disinfect place of a sting, as well as track the condition of the child within three weeks. At the slightest sign of illness should contact a physician. Chickenpox is one of those diseases that are better tolerated in children: a period of rashes in children usually occurs without significant deterioration in the general condition. Save the child from any risk associated with the chickenpox can help a vaccine. Infection with the Herpes virus is extremely dangerous for newborns and infants, so at the first sign of herpes in infants (severe fever and extensive skin rash), you must immediately seek medical help. Toxoplasmosis may manifest in many different symptoms, including retarded growth and psychophysical development, emotional instability. In severe cases, the disease affects the eyes, heart, and other organs and body systems. Viral Hepatitis - Symptoms and severity of the disease are directly dependent on the pathogen. Some types of viruses can cause the development of chronic hepatitis, while others - the development of serious complications. Flu in children - a disease dangerous its complications. It is important to recognize the symptoms of influenza and start the correct treatment to prevent complications. Rubella is usually not dangerous for children, and often is mild, practically without symptoms. In rare cases may develop neurological complications of Rubella. 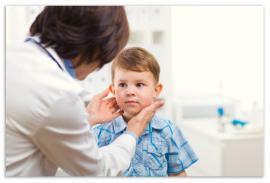 Infected with Human Papillomavirus child may even after brief contact with a carrier of infection. At occurrence necessary to begin treatment - is the removal of tumors, carrying antiviral therapy. Fungal diseases in children usually develop due to lower immunity, so at the appearance of their symptoms should see a doctor and to exclude systemic failure of the organism by fungus. Careful treatment will stop the disease. Meningitis is more common in young children. The disease is dangerous for its complications - death, violation of intellectual and physical development, so at the first sign of meningitis in a child urgently needs to seek medical help.